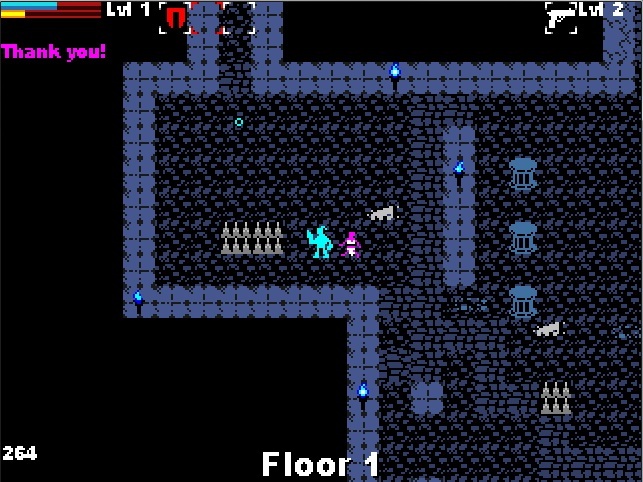 Shoot First is firstly a roguelike, you run around cramp corridors and fight your way through monsters in larger ones. 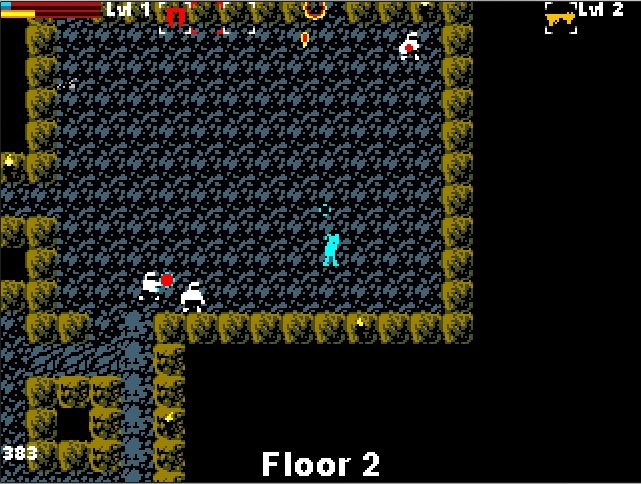 A small problem I had with the game is that in those said tight and cramp corridors you can set off a boulder trap. It’s an Indiana Jones style boulder where you run away from it, except in more cases than none, you can’t escape it. The boulder just goes too fast and you can never run away to another corridor or room quick enough to not take damage. Shoot First generates a randomly generated world every time you start the game. This can be good or it can be bad. 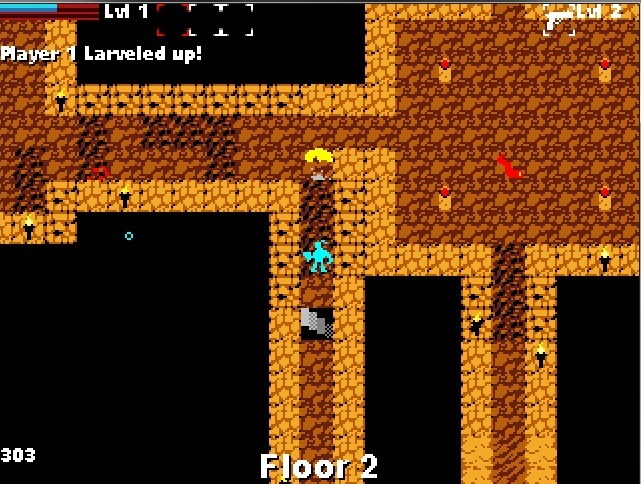 You can start in a cramp corridor with nothing but boulder traps, or you can start in a room right next to a boss like Darius. It’s both a good thing and a bad thing that ultimately is, in my opinion, a bad thing. While I usually like it when games have randomly generated content, this one feels too random. It is almost to the point that it is dangerous to do anything. Another thing the engine does that is annoying is that sometimes the engine will generate a world where there are long corridors that take you nowhere. No treasure chests, no enemies for experience, nothing, just a dead-end. It can frustrating walking down a seemingly endless corridor only to find that it wasn’t worth the venture. Shoot First has a wide assortment of enemies that are different for each tileset. Most enemies shoot whatever it is they shoot at you and then there are others with more unique weapons. Some extend their arms at you, and then retract them. Some are like frogs and use their tongues. Others shoot a ray at you that charges up and deals damage over time when you are in the ray. Then there are bosses. As mentioned before there is Darius. He is a wizard of sorts that shoots rockets. He is very hard. There are a few others, but you’ll have to encounter them yourself. Shoot First also has a wide assortment of guns and loot to be had. Guns are of the standard fair, rockets, machine guns, pistols, etc. Each has a unique property that levels up with you and are lost up getting a new gun. So it is better to stick with a gun you like and level it up. Then there is loot that ranges from maps to armor. I haven’t received too much of this as loot is very hard to get. Maps are the most common however, and you can generally find one in each floor. Speaking of leveling up, each time you defeat an enemy he drops orange things. Picking those up grant you experience points. Grabbing enough of these level you up. One small nitpicking thing I have with this system is that sometimes the orange things land on spikes in a location I can’t reach it without getting hurt. This is just nitpicking though. One last thing that Shoot First does is everything you do grants you points. 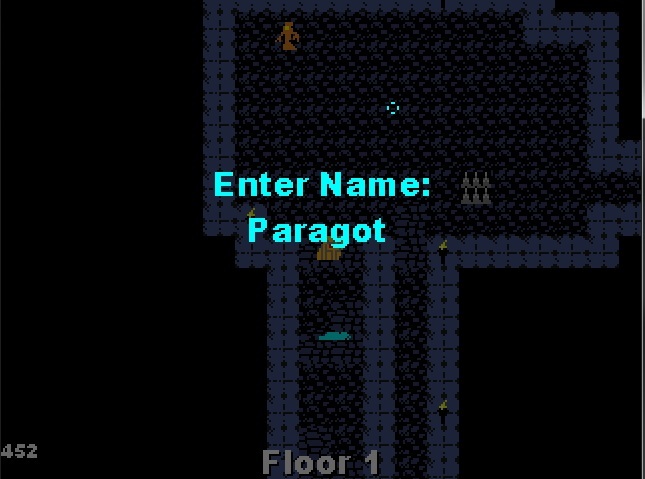 The main goal of the game is to get a high score by delving deeper into the dungeon. One way to boost your score is by rescuing damsels in distress. This is not as easy as it seems though. When you find them you walk over to them and they thank you for finding them, then you have to transport them back to the entrance to the floor. During this time they can be shot by enemies and die if they get hit too much. This can be rather annoying, but it makes sense. When you die in Shoot First, and let me tell you, you will die a lot, you are presented with a screen to input your name. You are then put on the high score list and you have chance to see how many points the number one person has in comparison your score. It is very pitiful. In my case anyway I was nowhere near his score. Shoot First has some great music that accompanies the game. Its lovely 8-bit music that I just go crazy for. The graphics are nice 8-bit sprites on a slightly more detailed 8-bit world. It is very simple, but yet very nostalgic. If you enjoyed old DOS games then you’ll enjoy this one if only for just a few hours. To sum up, Shoot First is not a bad game, but there are some more things that the developer can do to make it better. I do suggest it anyone who wants a quick nostalgia fix, though, so if you’re into that give a whirl.